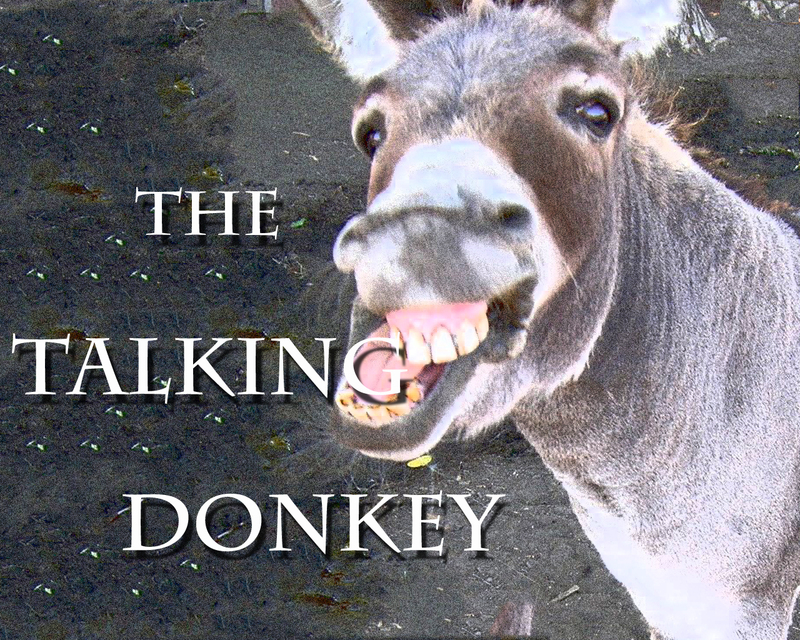 Did you know there was a real, live, talking donkey in the bible? Did you know that Kefa (Peter) made a reference to this talking donkey in his 2nd letter (2nd Peter)? You may be wondering how a talking donkey can possibly teach you anything of value. You may be surprised . . .
to THOSE that would live UNGODLY lives . . .
We learned that God regretted making humankind. We learned that His heart was grieved. But one man, Noach (Noah), found favor in God’s eyes because he was a preacher of righteousness. The preacher Noach, had 3 sons: Shem, Ham, and Yefet (Japheth). Noach was a “man of the ground” or “farmer” if you will. Noach planted a vineyard, drank a lot of wine and got drunk. and told his two brothers outside. This is where we learn a little about the heart of Ham. Ham could have shown respect for his father and just covered him up . . . but he didn’t. He went to tell his two brothers outside. Walter C. Kaiser et al., Hard Sayings of the Bible, (Downers Grove, IL: InterVarsity Press, 1996), WORDsearch CROSS e-book, 117.
all the imaginings of their hearts were always of evil only. Did his brothers come in to gaze with smug satisfaction at their naked father as well? NO! went in and covered their naked father. so that they did not see their father lying there shamefully exposed. Quite the opposite of Ham. Ham SAW, Shem and Yefet DID NOT SEE. With this is mind, try to understand the what happened next . . . Noach sobered up. The text says he knew what Ham had done. Was this because Shem and Yefet told him? Was it because Noach was coherent enough in his drunkenness to see Ham staring at him or making fun of him? The text doesn’t tell us, it just says he knew. 24 When Noach awoke from his wine, he knew what his youngest son had done to him. 26 Then he said, “Blessed be Adonai, the God of Shem; Kena‘an will be their servant. 1 God blessed Noach and his sons and said to them, “Be fruitful, multiply and fill the earth. This is the point where history uses the Curse of Canaan to justify slavery. That black skin is a curse from God to be exploited for selfish gain. The utter nonsense associated with legitimizing slavery as a result of Canaan’s curse is an entire subject in and of itself and beyond the scope of this post. The Israelites defeat the Amorites. The Amorites are from the lands of Syria and Canaan. Canaan is the son of Ham. Ham is one of the sons of Noach (Noah). When the Israelites set up camp in the plains of Moab, the king of Moab and all his people were terrified. After all, the Israelites had defeated the Amorites and were now on their doorstep. in the plains of Mo’av beyond the Yarden River, opposite Yericho. The king of Moab is a guy by the name of Balak son of Zippor. Balak talks with the Midianites (decedents of Midian – a son of Abraham). Joseph was sold by his brothers to the Midianites. The Midianites had a priest named Jethro that you may remember was Moshe’s (Moses) father-in-law. its people are spreading out everywhere and threatening to take over our land. 6 They outnumber us, so please come and put a curse on them for me. 22 … Bil‘am the son of B‘or, who practiced divination. Balaam tells the Moabite leaders to stay the night and he will tell them the next day what the Lord tells him. of the LORD my God in even the smallest matter. Here is the part you have to pay attention to. God tells Balaam to go and Balaam goes . . . and God gets angry because Balaam goes. saddled his donkey and went with the princes of Mo’av. Balaam knew that Israel was blessed. Balaam did NOT tell the delegation that God had said that Israel is blessed by Him. If he had, it probably would have ended the Moabites attempts to have the Israelites cursed by him. A good question to ask right about now is WHY didn’t he tell them Israel is blessed? As you ponder that question, let’s see what happens to Balaam on his journey. 21 (LY: iii) So Bil‘am got up in the morning, saddled his donkey and went with the princes of Mo’av. “Dude! What have I done to you? Why do you keep beating me? “Dude, you have ridden me your whole life right? Have I ever done this before? you won’t even enter the Kingdom of Heaven! is whoever makes himself as humble as this child. 25 When the donkey saw the angel, it moved over against the wall and crushed Balaam’s foot against it. Again Balaam beat the donkey. Benjamin didn’t even need to know about the angel to know this was the work of God. So here comes the real question, why didn’t Balaam as well? Ben didn’t know there was an angel in the story and Balaam didn’t know there was an angel. Ben saw the work of God immediately – Balaam only saw a stubborn donkey and even argued with it until . . .
and Balaam threw himself face downward on the ground. 33 But your donkey saw me and turned aside three times. From Syria, from the eastern mountains. ‘Come speak for me,’ he said. Or speak of doom when the LORD has not? I can watch them from the hills. They know they are blessed more than other nations. There are too many of them to be counted. He is not a human who changes his mind. He speaks, and it is done. And when God blesses, I cannot call it back. Will bring her no misfortune or trouble. They proclaim that he is their king. He fights for them like a wild ox. That can be used against the nation of Israel. 4 Who can hear what God is saying. A vision from Almighty God. Like aloes planted by the LORD Or cedars beside the water. And plant their seed in well-watered fields. And his rule shall be extended far and wide. Crush their bones, smash their arrows. When it is sleeping, no one dares wake it. And receive the knowledge that comes from the Most High. And I see the nation of Israel. will arise in that nation. Like a comet he will come from Israel. And beat down all the people of Seth. “Who are these people gathering in the north? This is a long post I know. The history was and is necessary before we can approach our study in 2nd Kefa (Peter). According to Jewish tradition and the most likely interpretation of the Old Testament, Balaam was a dishonorable character. For the sake of money, Balaam had led the Israelites into cultic prostitution with the Midianites, bringing God’s judgment on them and leading to his own death (Numbers 31:8; Joshua 13:22). 8 They killed the kings of Midyan along with the others who were slain — Evi, Rekem, Tzur, Hur and Reva, the five kings of Midyan. They also killed Bil‘am the son of B‘or with the sword. 22 Along with the others the people of Isra’el killed with the sword, they also struck down Bil‘am the son of B‘or, who practiced divination. Jewish literature considered him the ultimate prophet (and sometimes philosopher) of the pagans but did not reduce his role in Israel’s sexual offense. His attempt to make Israel sin was considered worse than any other nation’s military attack on them because it brought God’s judgment against them. The contrast between “the way of Balaam” and the “right way” reflects the common ancient image of two paths, one leading the righteous or wise to life, the other leading the foolish to destruction. Craig S. Keener, The IVP Bible Background Commentary – New Testament, (Downers Grove, IL: InterVarsity Press, 1993), WORDsearch CROSS e-book, Under: “2 Peter 2:1-22 Damnation of Immoral Teachers”. For more on Bil’am see Rv 2:14N. 14 Nevertheless, I have a few things against you: you have some people who hold to the teaching of Bil‘am, who taught Balak to set a trap for the people of Isra’el, so that they would eat food that had been sacrificed to idols and commit sexual sin. David H. Stern, Jewish New Testament Commentary, (Clarksville, Maryland: Jewish New Testament Publications, Inc., 1992), WORDsearch CROSS e-book, 760. Balaam has become known in history as a man who sought to make personal gain at the expense of his ministry (see Numbers 22-24). He is a perfect example of what Peter was dealing with. Balaam sought to manipulate truth so as not to deny it, but to use it for his own advantage. He was not all bad, and much of his message was true; however, he finally lost out completely. He became numbered with the enemies who, according to his own prophecy, were marked for destruction, and his sad end is told in Numbers 31:8. Peter said the false teachers had abandoned the right road. They had gone astray by following in the footsteps of Balaam, the prophet who commercialized his gift. He sought the reward offered by Balak, “the wages of unrighteousness.” He loved earthly things more than heavenly things. “Loved” is from agapaō, an intense kind of love, the word used in 2 Timothy 4:10: “Demas hath forsaken me, having loved this present world.” The final wages of sin is death, though the present pay may seem desirable. Thoralf Gilbrant, ed., The Complete Biblical Library – Hebrews-Jude, (Springfield, IL: World Library Press, Inc., 1989), WORDsearch CROSS e-book, 343.
so that the plague broke out among Adonai’s community! Balaam is the prototype of the false teacher. They lead people astray – down the wide path – towards destruction prophesied about long ago by Balaam himself. And you know what, in the end, they are not the problem, the people that gather them around them and listen to them are. I encourage you to read my post They are NOT THE PROBLEM . . .
they have been destroyed in the rebellion of Korach (Korah). This entry was posted in False Teachers and False Teaching and tagged Balaam, Bil‘am, talking donkey. Bookmark the permalink. How did the donkey talk? The Lord gave the donkey the ability . . . blessings!